Race + Brunch :: Cafe Crespin | .liveit.loveit.blogit. Several weeks ago, I decided to sign up for the 7km UNICEF Carrera Por La Educacion that happened yesterday in Buenos Aires. Something about having a race on the horizon helps keep me on track. It was probably the best thing I could have done on a Sunday morning. This race, more than almost anything else I’ve done in BA, made me feel like I am part of the bigger community. Compared to North America races, this one was a steal. 85 pesos ($20) for the run, and it includes a super cute technical race shirt. But even better? I rocked the race. My regular pace is about a 5:30 km. This run? 5:05 kms, despite the heat and humidity. I was in such a cheerful mood, I walked the 4.5k home from the finish line with a gigantic smile on my face. So big that a guy on the street asked me if I won. And, while I I didn’t win, I think I did place fairly high among the women – the course circled back on itself a couple of times, and in the last two kilometres I didn’t see all that many women out in front of me. I’ll update with official results once they come out. For now, here’s my Runkeeper stats. Unsurprisingly, by the time I got home and got showered, I was starving. On the itinerary? 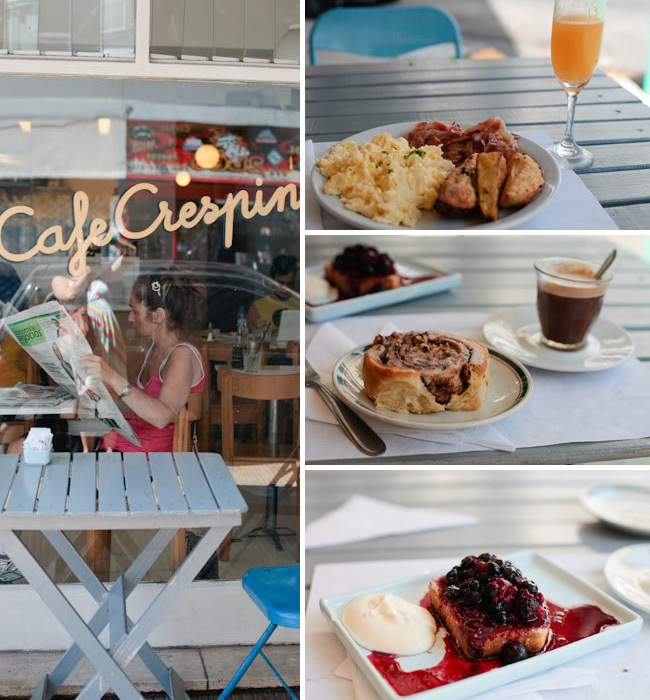 The amazing sounding brunch at Cafe Crespin, a Villa Crespo cafe/restaurant. 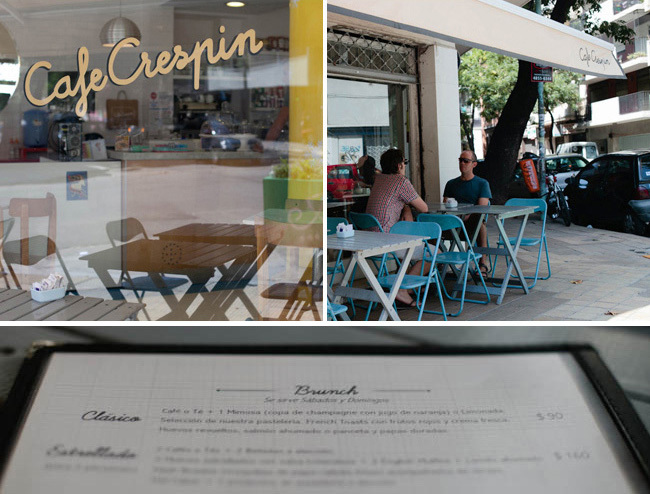 Cafe Crespin is a super cute little restaurant in Villa Crespo. I had googled this one after walking by it a couple of times (like during this photo shoot) and was delighted to find out that it was a little bit famous for its weekend brunch. We got there at about 12:15 on a Sunday (15 minutes after it opened) and there were a handful of patrons. By the time we left, just after 2, most tables were filled (but there was no waiting). We ate outside under the shady awning, but the inside is decorated in bright white with pops of blue and yellow – only my favourite colour combo. I would happily soak up the ambience either inside or outside this cute place. Another huge plus … the service. My Spanish is not awesome and I managed to order my eggs well done (it’s the little things in life, people). Rather than getting impatient with me, the server seemed delighted that we were able to communicate this food preference, despite our language barrier. I loved her. Cheap? No. Insanely good value? Absolutely. First up – the drinks. The mimosa was a little too boozey for my taste. Our friend Ian ordered the lemonade – turns out it was infused with honey. So good. I’d opt for the lemonade next time. But, it gets better. The food. I don’t have much to say but “wow”. The first course was the American “bacon and eggs”. My well done eggs were cooked to perfection (if you don’t like your eggs runny, I’d recommend ordering them well done) and were soft and fluffy. The panceta was a little oily for my taste, but the hubs ordered the smoked salmon and said it was awesome. The potatoes were crispy and tasty. Perfect. Next up, was our coffee and pastry. At a glance, I didn’t have high hopes for the cinnamon role – and I’m happy to report that I was totally deceived by appearances. It was gooey and moist and the perfect balance of cinnamon and sweet. The coffee… well, let’s just say it was typical BA coffee. And you know how I feel about BA coffee. The final course was the french toast. It was served ambient temperature, which was unexpected, but surprisingly good! It was very dense eggy french toast, but well cooked, which is a must in my books. The berry compote and cream were both delicious. I’m happy to report that I enjoyed every bite – and polished off – my multi course breakfast. I’m also happy to report that it had serious staying power. (Probably because of all that protein.) By 9:30pm, I realized that there was no way a big dinner was happening. Cafe Crespin, Vera 699, Villa Crespo, Tues to Fri 8-20, Sat 9-20, Sun 12-19. At 90 pesos per person, this Classico brunch isn’t cheap. But it was my breakfast, lunch and almost my whole dinner for the day. I’d go back in a heartbeat. I would love to try the Estrellado brunch (a 2 person brunch featuring benedicts, hot cakes, hash browns, greens, and pastry for 160 pesos) or some of the smaller, more manageable simple breakfasts. Note: the gigantic brunch menus are only served on weekends. Awesome job on the race! :) What a great experience. May I ask, how you got started in running? I am very much wanting to do my first 5K in June, but not too sure where to start. Any suggestions? Thanks Courtney! I’ve been running (on and off) since I was about 12 and find that my base level of fitness – even after time off for injuries – has me able to run a 5km. That being said – my brother’s partner is currently doing the Couch to 5k (C25K) program and having great success with it. It’s a free 9 week program (but there’s nothing saying you can’t start now!) that only takes 3 workout a week! People tweet their progress with the hashtag #c25k – helping you find a community of people in the same week as you! I think it looks like an awesome program! If you think that’s not going to be enough to get you off the couch, I recommend a running room clinic. I did one for my first 10K, and it was a great way to start! And now I know the first place I’m going for breakfast if I ever visit — good value, yes! And I’m still so used to Oz prices that I’m not too fazed when I read prices in the high teens or low 20s for a meal — though you wouldn’t get that that much at that price in Oz mostly likely! The french toast is calling my name .